TEMPORARY repairs to Grafton Bridge mean it's back to business as usual, but it looks unlikely the river crossing will be back to its former glory by its next birthday. Roads and Maritime Services worked through Wednesday night and into the early hours of yesterday morning to install a steel guardrail at the site of Wednesday's single-vehicle collision that caused chunks of the bridge's concrete side barrier to fall from the bridge and into a Grafton resident's backyard. The crash happened just 10 days shy of the 82nd anniversary of the bridge's official opening on July 19, 1932. 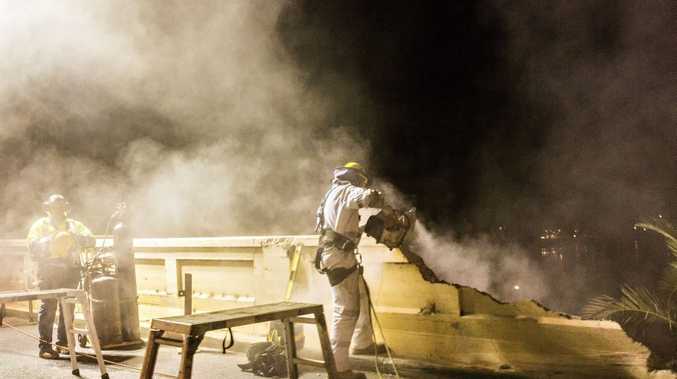 Following the temporary repair work, a Roads and Maritime spokeswoman assured people the bridge was structurally sound and said planning was under way for permanent repairs to the side of the bridge. "Residents will be advised of planned traffic changes when appropriate dates for night work are identified," she said. Construction on a second Clarence River crossing is expected to start next year, and is due to finish in 2018.